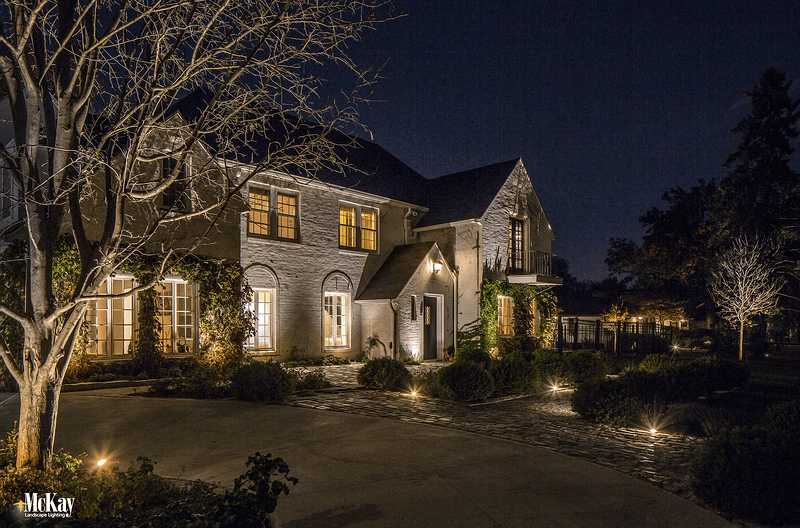 When adding landscape lighting to your home, there are many areas to consider. Illuminating the walkway leading to the front entrance is one of the most popular areas. There are several beneficial reasons to light the walkway too. It can create a warm and inviting feel while safely guiding guest to your door and increasing security when strategically designed. 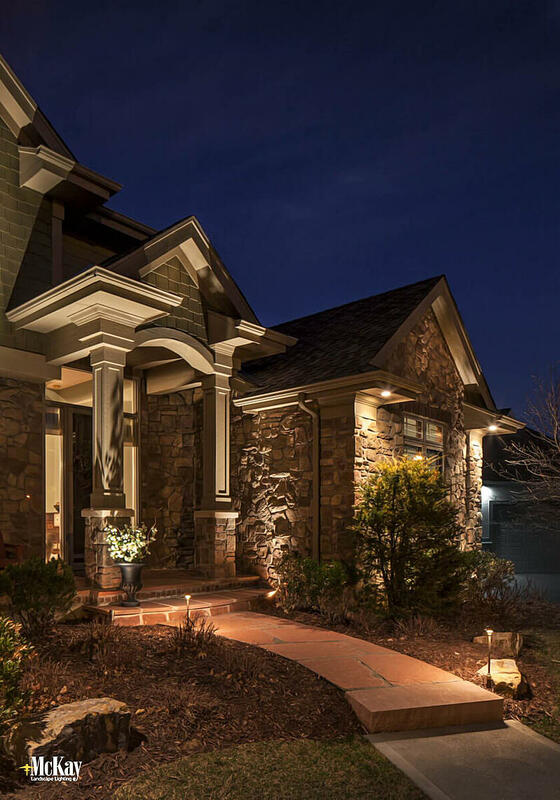 Here are some traditional and unique front entrance path lighting ideas for your home. The most common application involves the use of path lights. These fixtures are approximately 14”-18” or taller. You might have noticed this popular technique while browsing photos online or driving by homes at night looking for ideas. 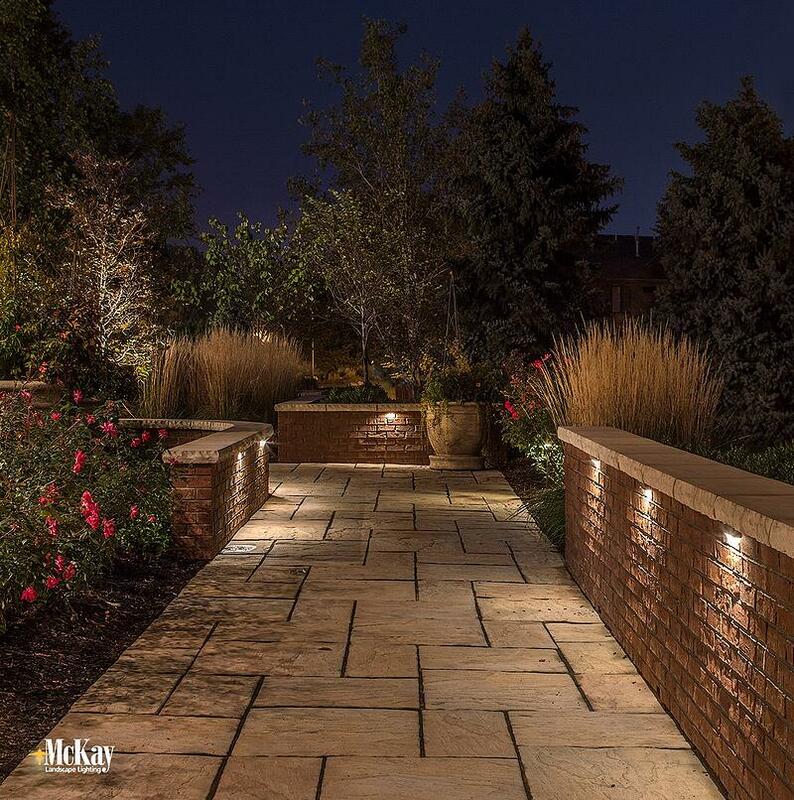 The key to using path lights is finding the perfect balance for your walkway. Too many lights will give a runway type of look while too few lights will leave dark spots. At McKay Lighting, we often stagger the position of these fixtures considering their size and beam spread. This technique helps evenly illuminate the walkway without overpowering it. Bollards, similar to path lights, are another popular option. This taller and wider fixture is ideal for driveways and wide paths. The home pictured above has a wide walkway leading to the front entrance from the circular driveway. The extra height provides a larger beam spread for more even illumination to the entire path. Just like path lights, you'll want to carefully consider the fixture placement to find the perfect balance of light. Learn more about using these bollards for driveways or wide paths here, or learn more about decorative light bollards here. 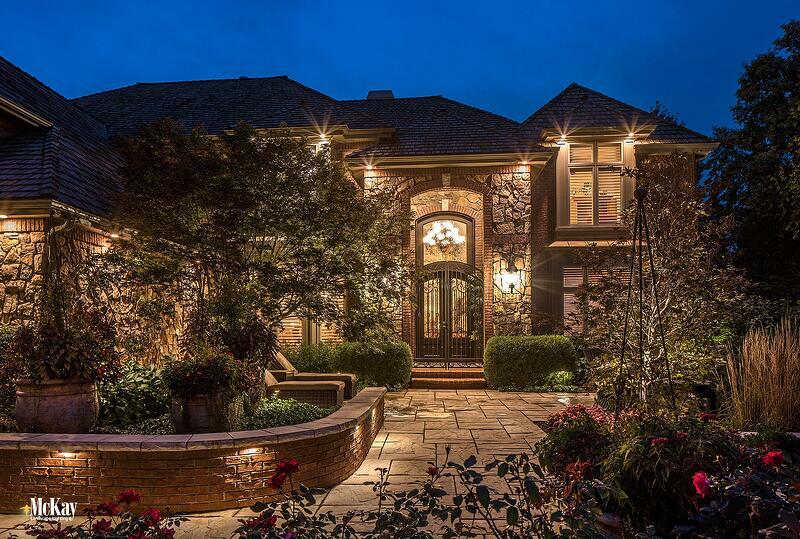 If the path leading to your home has a wall or similar structure, wall lighting is a unique way to illuminate it. The gentle splashes of light help make the walkway more safe, secure and inviting. The home pictured above has a wide walk space. The homeowners wanted a warm and inviting yet safe entrance so guests could see as they are coming and going. We were strategic with the light spacing, not too much but enough where it makes sense. We installed the lights as the homeowners were remodeling their front entrance to include the seat walls. Coordinating with other contractors involved in the project was key to achieving this approach. A client of ours wanted a unique and different option for lighting their front entrance walkway. The home's elevation relation to the road was a concern as far as the fixture selection and positioning. We wanted to ensure the light source would not accidentally cause glare as people drove by the property. This low-profile brass LED fixture was the perfect solution as it complements the style of the home, perfectly (and uniquely) illuminates the walkway and is not obtrusive to people as they pass by. You can learn more about this technique and see the behind the scenes footage of it being installed here. While there are several ways you can light the front entrance of your home, the techniques above are all great options for enhancing the beauty and increasing safety. If you would like to meet with one of our lighting designers for more ideas customized to your home, you can schedule a free consultation online. 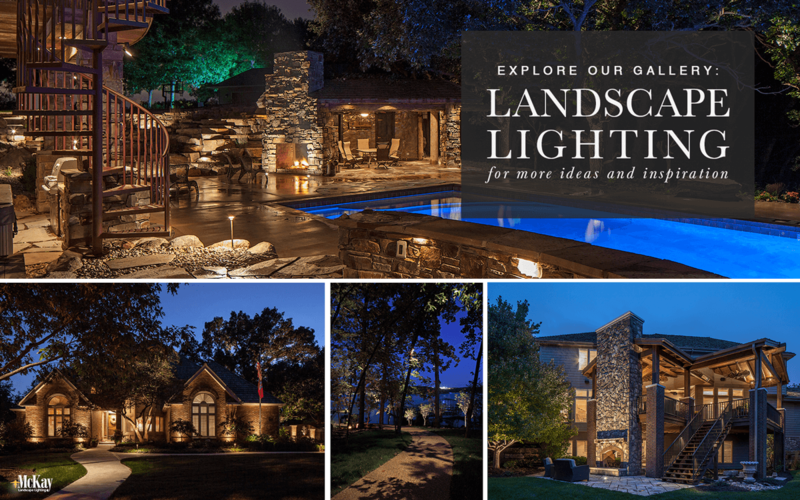 We’ve been in the landscape industry since 1987, becoming a dedicated landscape lighting firm in 1992. 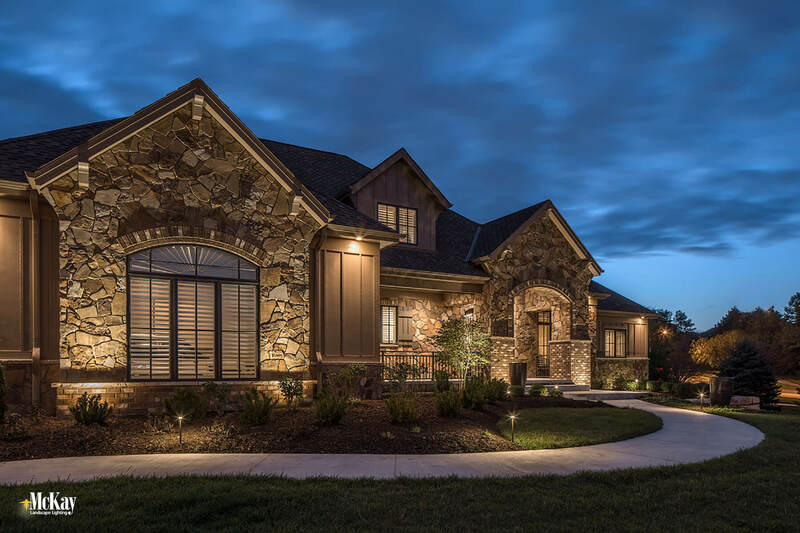 Our team has years of experience creating and installing unique and elegant outdoor lighting designs, and providing maintenance and repair services to homes and businesses across the nation. Our award-winning company has been voted Best of Omaha and Best of Houzz by the community.